Hey, remember the other day when some of you (no names!) were all upset because you couldn’t go outside and walk for more than a few minutes without your fingers and toes falling off? ‘Cause you’re all, y’know, snowflakes? Well, for those of you who are still knee-deep in snow, ice, or whatever it is that happens outside my warm, comfy Southern California bubble, here are some ideas to keep you walking! 1. 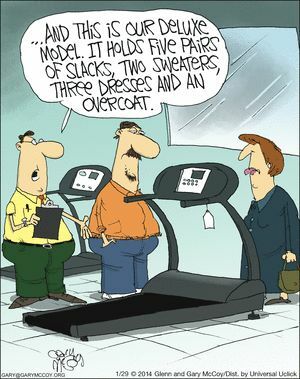 Treadmill – by far the most popular. If you belong to a gym, and the roads are clear, you could always just hop into your Humvee, crank up the heater, and drive there. [Note to self: insert plug for Anytime Fitness Chatsworth here!] Unfortunately, for a lot of people, the roads AREN’T clear. Not a problem if you’re rich, right? ‘Cause you’ve already got one at home. But not everyone’s rich. you might be able to get one cheap, or free! Just look for a neighbor, friend and/or relative who lost a lot of weight in the not-too-distant past, but has recently started to pile on the pounds again. Chances are they’ve got some kind of exercise equipment in the basement, doubling as a clothes hanger. Now that they’ve lost their will to stay in shape, they’re probably sick of looking at it. A few discreet questions, a little faux sympathy, and heck, they’ll probably pay YOU to haul it away! Score! 2. DVDs/Videos – Yeah, a home treadmill is nice, but if you don’t have one, and you can’t get out of the house today, well, it’s kind of a moot point, isn’t it? Not to worry! Most of us (by which I mean, those of us who are around/over 60, which I assume is my target audience, given the blog title) still have a DVD player around, or even (gasp) a VHS player! So check your bookshelves and your videocassette drawers to see if you have any of those awesome Leslie Sansone walking workouts! They … [voice whispers offstage] Huh? Oh really? OK, well, I guess you could also get them online, via YouTube or Amazon or one of them newfangled digital thingamabobs. If you want to be all modern and everything. Anyway, whatever format you can find them in, her workouts are actually a lot of fun, and you can get the same workout as a brisk walk outdoors. It’s worth a shot! 3. The Laura Ingalls Wilder “Long Winter” method — You all remember Laura Ingalls Wilder and her family, right? Well, here I’m talking about the real one, not the blow-dried ’70s TV version. The REAL Ingalls family had the bad luck to be living in De Smet, South Dakota during what’s now called the Great Blizzard of 1888. You can read all about it in her book, “The Long Winter,” available at all fine bookstores and non-“woke” libraries. Anyway, while Laura, Mary, and Carrie were stuck indoors, Pa and Ma made sure they got plenty of exercise – Pa by playing his fiddle and marching them around the cabin, and Ma by making them sweep the floors, clean the stove, and oh, just generally doing everything she was too tired to do herself. What a great time they had! So if you have any kids around the house, make them do some exercise while you sit and watch. You’ll all feel great afterwards! 4. Mall walking — Again, this is only for people that aren’t completely snowed in and have a reliable vehicle of some sort. You can walk around for hours and hours, eating and drinking, stuffing your face, maxing out all your credit cards … it’s great! And it counts as exercise, too! (Although that stuff you got at the food court might cancel out some of the calories you’re working off.) Still, it’s worth a try, and who knows, maybe you can get some groovy new tunes to add to your mix tape while you’re there, too! 5. Get a dog. Dogs don’t understand “It’s raining outside, you’ll have to wait.” If you don’t take them outside for even a *short* walk, you’ll regret it. Maybe not now, but later, especially when Fido gets desperate and poops in your laundry hamper. Trust me, bundle up and walk the dog. If you don’t have one, you can TRY walking the cat. It’s a long shot, though. Maybe you could just walk your IMAGINARY pet. Oh, all right, all right – if it’s THAT bad, stay inside, build a fire in the fireplace, toast some marshmallows, make some hot chocolate, and relax! I hereby absolve you from having to walk, at least till the icicles on your eyebrows start melting. Stay warm, everyone – see you Monday! **DAY 5 Walk done! Since the weather’s dried out (marginally!) I was originally gonna drive to some faraway, exotic place (like, I dunno, Pacoima or Simi Valley) and do a walk in a completely different locale, but at the last minute decided to do yet another Reseda walk. Just put on my walkin’ shoes (Skechers!) and headed out. And once I got out there, it was nice. It’s ALWAYS nice, once you get started. So just GO! ← Stormy Day 4: now THAT’S motivation!